Lord Ganesha enjoys a pride of place in the Hindu pantheon. His very appearance, with his pot-belly, elephant face and the broken tusk elicits certain affability in the beholder and makes Him endearing to Hindus across the world, regardless of their age. Ancient Hindu scriptures are replete with references to Ganesha and carry some picturesque epithets that describe his attributes. 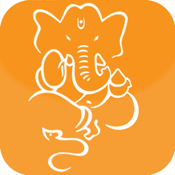 This APP contains 48 slokas on Ganesha who is worshiped at the beginning of any endeavour - spiritual, educational, business or travel! 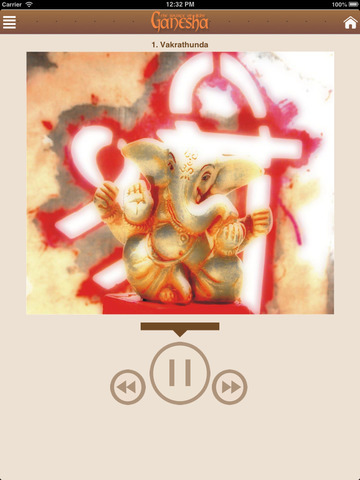 Rendered with perfect intonation in a resonating voice, these Sanskrit verses unfold the beauty, power, charm and the grace of Lord Ganesha in a telling manner. Transliteration of each verse supported by translation in English with a colourful sprinkling of the Lord images in various countenances and postures make this product an audio-visual delight. And what more, it serves as a learning aid that helps the user to understand the meaning and chant the slokas with the right diction as enjoined in ancient religious texts to make them effective. Play it, fill the air with the chants of His name and feel the divine experience!